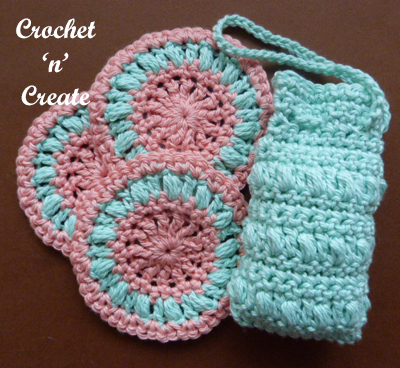 Crochet spa set, consisting of toilet bag, soap holder and face scrubby, ideal to pop in the luggage for your holiday or weekend away, I have designed it in soft cotton yarn in an easy puff stitch and single crochet stitches. * yo, insert in stitch and pull up loop, * rpt from * to * once, yo pull through 4 loops, yo pull through 2 loops. 2nd Row – ch1, 1sc in base of ch1, 1sc in each sc to end, sl st to first sc on beginning of row. Turn. 3rd Row – Rpt 2nd Row. Rpt 4th to 7th Rows until 31 rows have been worked in all or work measures approx 8 Inches from beginning. Next Row – ch1, 1sc in base of ch1, 1sc in each ch2 space and sc to end, sl st to first sc on beginning or row. Turn. Rpt 2nd Row twice. Fasten off. Chain Strap – Leave a tail of approx 5 Inches and ch120, using the 5 inch tail, thread through alternate eyelet holes, sl st to first ch to make a round. Fasten off. Pull sl st end of strap back to the inside of bag, pull strap to gather top and use as handles. Face Scrubby – With color 1 and a 5.50mm hook make a Magic Circle, work ch4, 12trc in circle, pull loose thread to close circle, sl st to top of ch3 on the beginning of the row. Turn. Rpt 2nd Row from toilet bag twice. Eyelet Row – Rpt from # to # from toilet bag. Chain Loop – Leaving a tail of approx 4 Inches, ch60, using 4 inch tail thread through alternate eyelet holes, sl st to first ch to make a round. Fasten off. Pull back sl st end to inside of soap saver, pull chain length to gather top and use as a loop to hang up with. 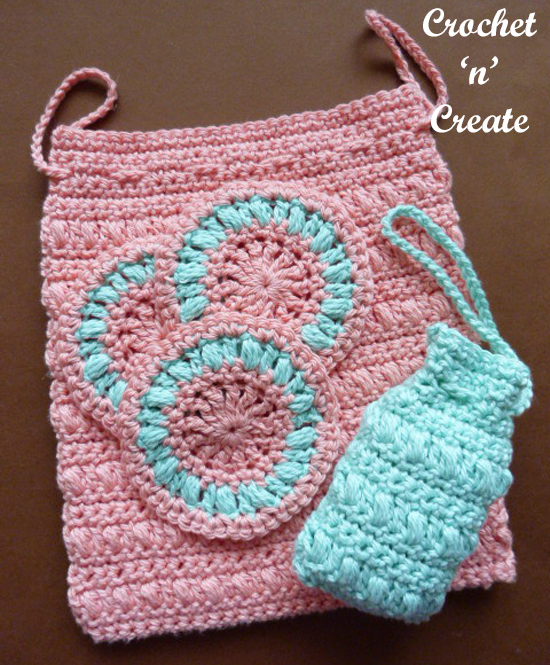 The written instructions and pictures for this crochet spa set pattern are copyrighted to crochet ‘n’ create © 2018. 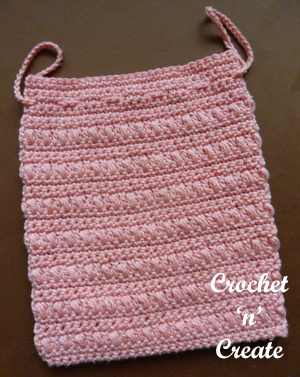 You are welcome to sell the finished products made from the free crochet spa set pattern, I just ask that you please use your own pictures and put a link back to crochet ‘n’ create. DO NOT share the written instructions for this crochet spa set pattern. 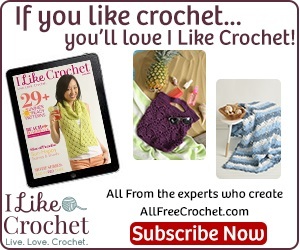 This entry was posted in crochet for bathroom, crochet for the home and tagged crochet, crochet for bathroom, crochet for travel, free crochet patterns on 17th April 2018 by crochetncreate.